I had two interviews lined up with Giles and it is a measure of his popularity that I was largely unable to talk to him during either of those slots. Luckily, he’d given me a sneak preview of the Beater’s design, and more importantly the design process, at his pen launch a few weeks before. I say importantly because it is: Ellis takes design, or rather, good design, extremely seriously. If Giles had his way, we’d have carrying handles on our floor speakers. And little spike-levelling wheels. And built-in spirit levels. And flying cars. I may have made that last one up, but you get the point (and if you haven’t, I do suggest taking twenty-five minutes out of your day to watch this Seminar from SalonQP 2014). 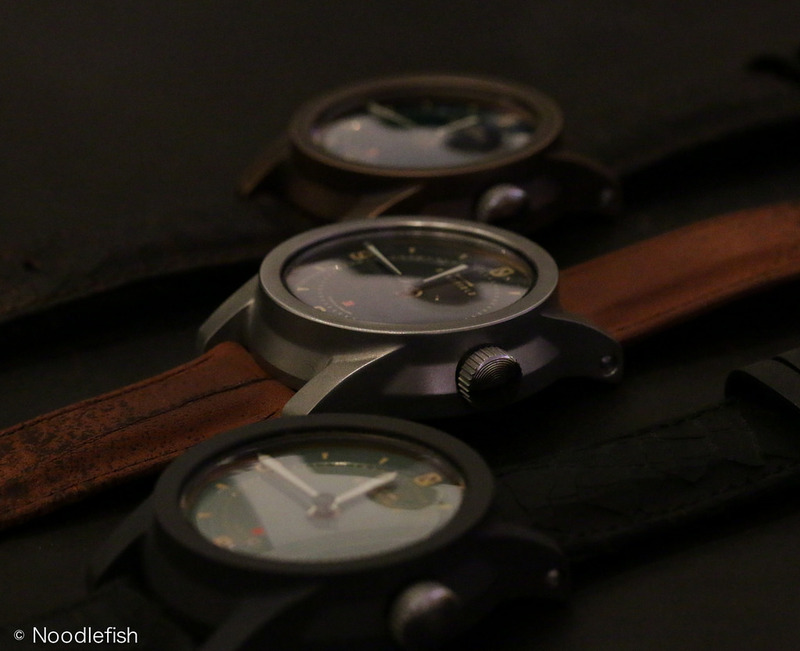 Good design, it seems, is not only good practice, but the raison d’être for all Schofield watches. I’ve written about this before, and I am in great danger of becoming a somewhat broken record, which is why I’d like to focus on the watch, and not the man. The Beater is the third watch to be released by Schofield, following the impossible-to-photograph Signalman** and the charmingly bonkers Blacklamp. I’ve considered both the Signalman and the Blacklamp as prospective purchases in the past, and still have those days every now and then when I wonder whether I shouldn’t just sell everything, buy the Royal Sovereign Lighthouse Blacklamp, and revert to owning, and wearing, a single watch. The Beater’s name is taken not from the hunting term, but rather from the name given by forum members and other #watchnerds to a wristwatch that can take some punishment. It’s usually an everyday wear, worn in, like a pair of jeans. The Schofield Beater is also an horological analgesic; it aims to relieve the owner of that future pain that she or he will go through when they notice that first scratch, ding or scuff by already appearing slightly used. Like dive watches of a certain era, Ellis also believes that the Beaters will age gracefully, and may, indeed, look even better following a few knocks and bumps. 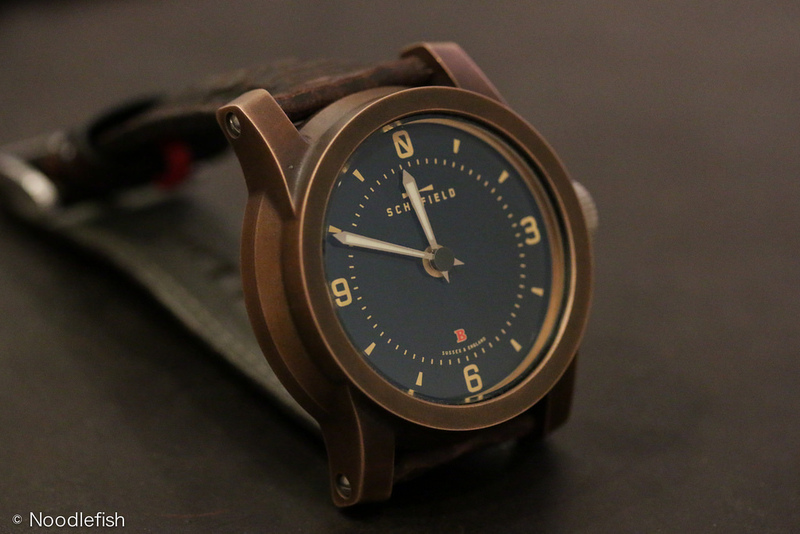 This pre-wearing (or force-patination) follows a trend that’s evident in both watches and denim. In the world of the latter, it’s lead to national papers asking whether it’s okay to wear the same pair of jeans for six months without washing them. In the former, it has descended into the use of eggs to accelerate the tarnishing of bronze-cased watches. Yes. Tarnish. In the world of watches, tarnish has become “a thing”, with recipes being traded freely, and an almost cavalier attitude towards bronze disease. In order to save the owner from potentially doing something silly, Schofield has force-patinated their bronze Beater using a combination of chemicals, such as selenium dioxide, while the steel version has been brushed and micro-bead blasted. A titanium-cased version has been blued at high temperature and then oiled. Each watch has then been hand-finished to complete the treatment: edges have been sanded, for example to provide contrast (as can be seen in the photo below). Of the three, my favourite is the titanium, no, wait, the bronze, or possibly the steel… Ellis calls it “paralysis by choice”. I call it making bloody nice watches. The 200m WR Beater case follows the well-trodden path of the Signalman and Balcklamp in having a tapering, chamfered lower portion, straightening towards the top third. It’s a very clever shape, providing interest, strength and a distinctive silhouette. In many ways, Schofield’s dedication to their case shape reminds me of another brand: LindeWerdelin. 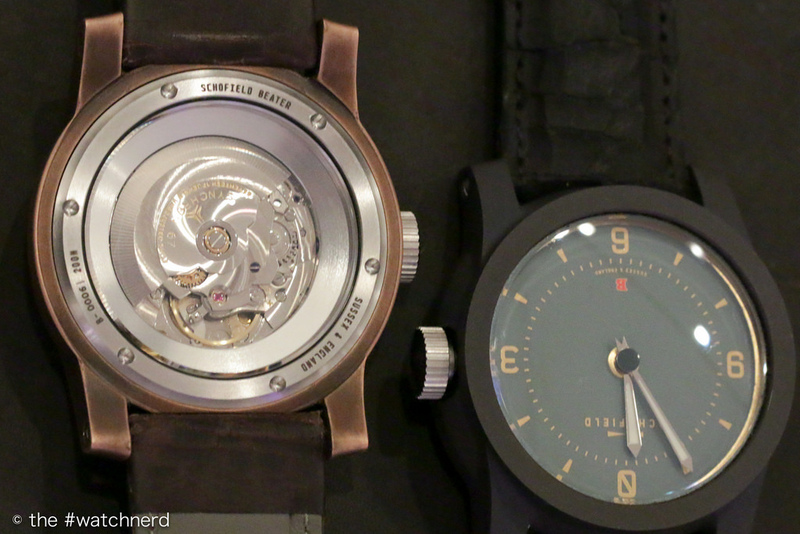 The latter has been quietly producing watches with almost exactly the same case profile since 2008. With LindeWerdelin, this is largely due to the Reef and Rock “instruments”, which sit on each watch, turning it from an analogue time device into either a dive or ski computer. The Beater cases have been made in the same UK plant as the Blacklamp, and a series of NOS movements has been sourced: in the case of the first batch, these are seventeen jewel ETA 2724-R from 1967, beating at 28,800bph and marked Synchron. The sapphire case back is affixed to the case by a rather attractively milled ring, which still proudly displays its turning marks. These marks are something of a signature element: when the prototype Beater was produced, it was sent in an unfinished state. It was this “unfinished” look that has been kept for the production models, ironically requiring much care and attention to ensure that the tooling marks and other raw edges are visible on the movement ring. Each of the watches sports a British-fired enamel dial, an unusual technique that generally requires a much greater outlay. As with all enamelled dials, there’s a warmth that’s hard to describe. Take Stepan Sarpaneva’s latest version of the K0 Korona, for example: the skeletonised blue metal reveals a dial of pure, yet natural, white. In the case of the Beaters, these dials are coloured and unique to the case (I did ask Giles about the colour ways – apparently certain combinations just didn’t work). There’s also an enamelled centre cap, sitting above the “sword and thorn” hands, something that’s become a mainstay of Schofield’s watches. I like the Beater. It does something that I feel is very important: it makes me want to touch it. 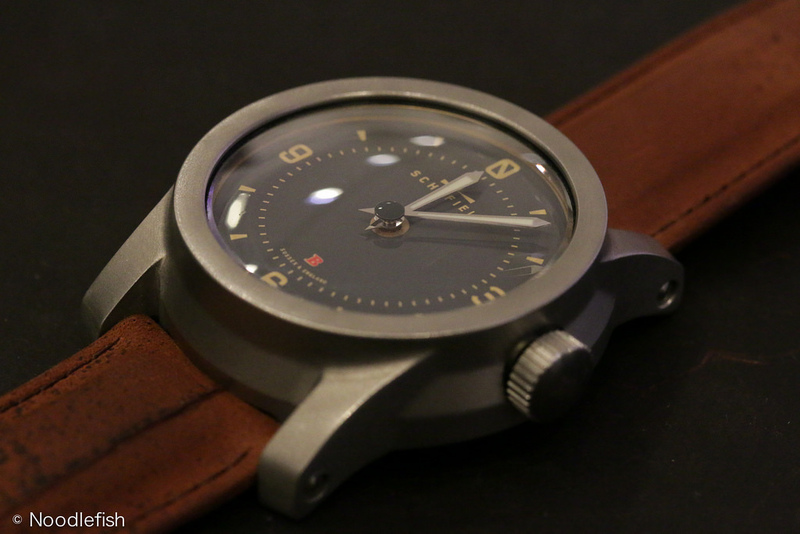 It’s a very tactile shape, accentuated by the three treatments that have been applied to the 44mm cases. Some of the sharpness has been removed, and the curves somehow accentuated. I am not a fan of brands using ‘”DNA” or “evolution” as shorthand to describe the next iteration of their models: I understand that there is a place for “brand DNA” or “product DNA” but it’s often used in such a lazy or thoughtless way as to become meaningless. However, I may break with tradition. The Beater range feels like a continuation of the brand; after the exuberance of the Signalman and the nexus of niche-ness of the Blacklamp, these watches feel more grounded, more obtainable***, more Schofield. It’s as if the ideas of the previous models have been rotovap’d; one does wonder how far down this route it’s possible to go – can you over-distil a design? If anyone can answer that question, it’s probably Schofield.